How would you like to turn your next LEGO® creation into a robot, programmed to do exactly what you tell it to do? The Bricks 4 Kidz Junior Robotics camp offers all the fun of building with LEGO® bricks, plus the challenge of computer programming! Using drag-and-drop icon-based software provides an introduction into the world of computer-programming and robotics that will equip children to succeed in a technology-based marketplace. This fun, action-packed week combines real-life skills with real-kid fun! 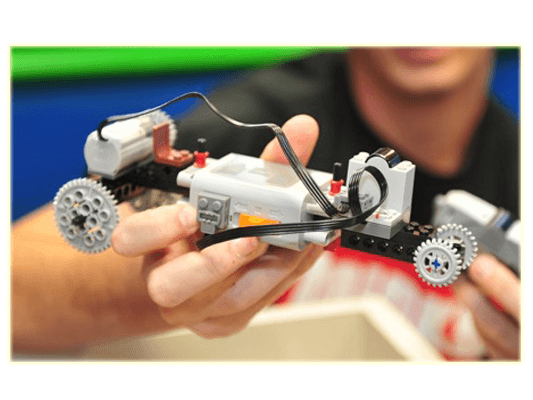 Experience the cutting edge of technology with the introduction of LEGO® MINDSTORMS EV3 Robotics. Students will be captivated as they incorporate the newest generation of motors, sensors and software by computer programming their commands and downloading them into the intelligent brick. Test their capabilities by moving an object with a robotic claw, building a robot that draws, or a creating a mouse trap. Our endless list of builds is sure to provide the complete fundamental components of robotics at best!